We have the FAQ, we have the system requirements, and now we have the real deal: One of the most highly-anticipated beta tests of all time is here at last. And hell, it's about time. We knew this was coming thanks to Blizzard CEO Mike Morhaime's announcement last week, and the FAQ and system requirements this week, but it's still kind of awesome to see it finally happen: The StarCraft II beta is live. I don't think I've ever seen so many people excited over a beta test for a game. Hell, I've never been so excited over a beta test for a game before. But the original StarCraft was a landmark title, and is widely considered one of the best games ever made - so a sequel twelve years in the making is bound to be slightly anticipated. The full press release is below - I need to go, um, polish my dog. My grandmother is on fire, guys, I need to run. Yeah, my grandmother. That's the ticket. Blizzard Entertainment announced today that the closed beta test for its highly anticipated real-time strategy game, StarCraft(R) II: Wings of Liberty(TM), has begun. Thousands of gamers around the world have started to receive invitations from the company to participate in the first phase of the beta test. 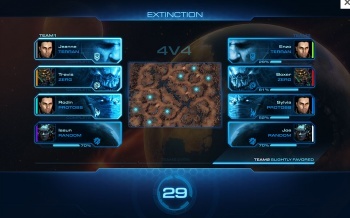 In addition to providing feedback on the multiplayer balance of StarCraft II, testers are also getting a first look at Blizzard Entertainment's revamped Battle.net(R) service, which will be the online platform for StarCraft II, World of Warcraft(R), and future Blizzard Entertainment(R) games. "Gathering concentrated feedback from our players is an important step for us as we head into the final stretch of development for StarCraft II and the new Battle.net service," said Mike Morhaime, CEO and cofounder of Blizzard Entertainment. "We look forward to having our players' help in polishing the overall experience and preparing for launch." StarCraft II: Wings of Liberty is the sequel to Blizzard Entertainment's 1998 hit StarCraft, which has been hailed by players and critics worldwide as one of the top real-time strategy games of all time. Sporting a vibrant new 3D-graphics engine, StarCraft II will once again center on the clash between the protoss, terrans, and zerg, with each side deploying legions of veteran, upgraded, and brand-new unit types. StarCraft II: Wings of Liberty is currently slated to ship in the first half of 2010. In addition, Blizzard Entertainment will again offer unparalleled online play through Battle.net, the company's world-renowned gaming service. A new version of Battle.net will be launched alongside StarCraft II with several enhancements and new features to establish it as the premier online gaming destination for Blizzard gamers.